Will fuel economy measure up? The new Edge comes with two features we'll unconditionally recommend, sight unseen: front and rear cameras and inflatable rear seatbelts. Provided you don’t need third-row seating or a luxury badge, the 2015 Ford Edge offers everything you might want in a comfortable, stylish, tech-savvy crossover. Diversifying its lineup of utility vehicles was one of the smartest product moves Ford made in the past years. The Ford Edge, one of those calculated moves into a growing crossover market, has really paid off—pulling in shoppers who wouldn’t quite want the brand’s Explorer or Escape SUVs, and those who decided they didn’t need squared-off ruggedry (and faux-ruggedry) to get a higher seating point and a little more comfort and versatility. Now a second generation of the Edge is on the market, for 2015, and it’s more of a global affair. The new Edge starts with truly world-class underpinnings—those of the current Ford Fusion, which has been named a Best Car To Buy and one of our highest-rated sedans—and looks outward to other markets, even China, where a long-wheelbase, three-row version will be built. 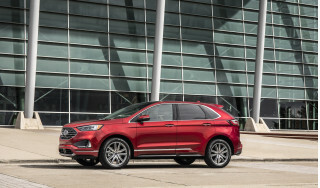 Ford calls the new Edge more athletic, and that’s no exaggeration, whether you’re talking about its styling or its performance. Here in the U.S., the Edge lifts some of its cues from the Fusion, along with a shoulder line that wouldn’t be out of place on a BMW. Ford has toned down the shiny chrome-bar grille, replacing it with a look that now looks a bit awkward-doppelganger with the Hyundai Santa Fe from some angles. The Edge Sport best escapes that look, with blacked-out details that bring out some of the best aspects of its design—and we see some sport-wagon undertones in the taillamps and lower-body work. Altogether, it's a look that upgrades the Edge's SUV silhouette, pushing the design closer to a premium look without cutting into its genderless appeal. 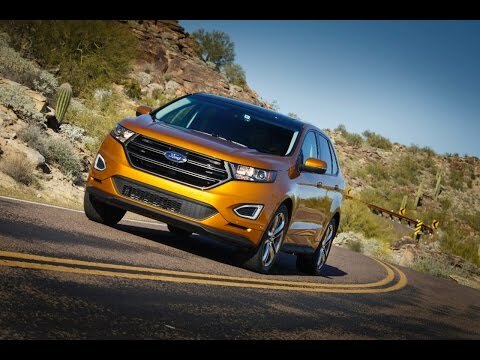 Inside, there are no qualifiers necessary; the 2015 Edge is far above and beyond the outgoing generation, with better interior finishes, and the dash shape that builds on some of Ford’s other models like the Focus and Escape. It promises to be a more functional place, too: the former capacitive-touch bars for volume and fan speed have been axed, with knobs and buttons making a welcome return to the center console. Under the hood there’s a mix of new and carryover powertrains. The base engine is Ford’s 2.0-liter EcoBoost, but it’s now rated at 245 horsepower and 270 lb-ft of torque; beyond those numbers, its drivability is better thanks to twin-scroll turbocharger technology that reduces turbo lag. You can now get the turbo four with all-wheel drive, and with a tow package it’s good to pull 3,500 pounds; we really think the 2.0T will be perfectly adequate for most needs, but for those who must have a V-6, the 280-hp, 3.5-liter engine has been carried over, as a $425 option. The most intriguing—and appealing, after a brief drive—model in the lineup is the Edge Sport, which subs in a twin-turbocharged, direct-injected 2.7-liter V-6. It's essentially the same design already being installed into the 2015 Ford F-150 pickup; here it makes 315 hp and 375 lb-ft of torque. Its understated performance look goes well with its driving personality—strong and confident, with no need to scream it out. On any Edge, a six-speed automatic is standard, as are paddle shifters, and normal and and sport driving modes; there’s no reason to discount the Edge for not having eight or nine speeds, as with the strong torque output of the EcoBoost engines especially, all you’ll miss is the hesitation that extra gears can bring. Fuel economy ratings are good, but not as class-leading as you might guess given the EcoBoost badging. 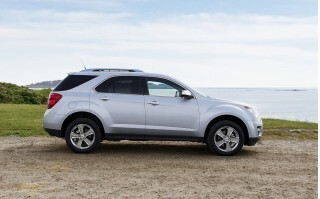 2.0T models range up to 20 mpg city, 30 highway with front-wheel drive, while the Edge Sport AWD model gets 17/24 mpg. Underneath the new 2015 Ford Edge, a fully independent suspension takes the place of the former twist-beam rear end. In front it's control arms, in back it's composed of multiple links. And to complement this, there’s a new steering system that really does give a precise, reassuring feel, tracking well straight-ahead, and taking a set into corners without fuss. The Sport model gets its own damper and spring rates, as well as rear monotube dampers, and standard 21-inch wheels, with 20s as an option. But with active noise cancellation, it actually rides quieter than the other models on coarse pavement, and leaves only the pleasant, off-cadence thrum of the larger EcoBoost engine. Across the lineup, there’s a muted sharpness to the driving experience; the Edge isn’t downright edgy in any drive respects, yet it’s precise and responsive. Up until now, the Edge has been a half-step behind rivals in interior appointments, but that changes dramatically with the 2015 model. The biggest improvement is that there are now soft-touch surfaces everywhere—not just up high, around the driver—and the cabin is seriously quiet and composed. It now rides on the Fusion's wheelbase of 112.2 inches (up 1 inch), while it’s gain of nearly four inches in overall length allows an extra seven cubic feet behind the rear seat, along with a total of 73.4 cubic feet behind the front seat and more than 39 cubic feet with the rear seat up. It adds up to good seating space, fundamentally, although short, flat cushions both in front and in back will be limiting factors to long road-trip comfort. Small-item storage is abundant and mostly well-designed, with a center-console pass-through and even a storage drawer to the left of the steering wheel. The Edge has fared well in safety tests, with top-tier results in all but the IIHS small overlap frontal test. This year it adds a new airbag mounted in the glovebox frame, to better protect passenger knees. Bluetooth and a rearview camera are standard across the board, while available safety features include LED headlamps, forward-collision warnings, parking assist with perpendicular parking now factored in, and rear-seat inflatable seat belts. And with new front- and rear-camera system and parking sensors, it’s the easiest Edge to park, ever. Altogether, the Edge ends up making sense as two things: a well-equipped Titanium or Sport, with all the 'good stuff' that reaches well above $40k yet rivals versions of luxury models like the Audi Q5 and Lexus RX, or as a value-based SE or SEL that takes on the Chevrolet Equinox or Honda CR-V, with a more premium look and feel. We haven't sampled the Edge in the latter form, but we'd bet it still stands up pretty well. 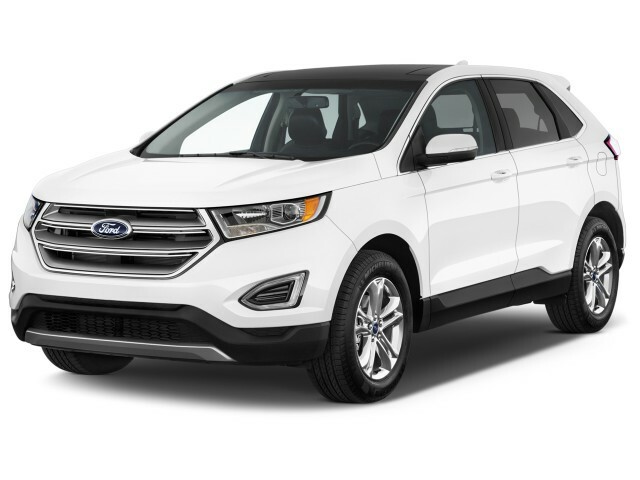 On the outside, the 2015 Ford Edge is clearly an evolution of the design direction set with the outgoing Edge: That amounts to a rakish front end with a very bold grille, and a side profile framed by sloped, prominent pillars. But there are plenty of new details in this ‘generation two’ Edge that make it a little more visually interesting. The grille loses the full-on chrome onslaught and instead goes with a more understated look—framed with thinner pieces of brightwork—that frames a trapezoidal grille. Taillights are a different design entirely, as they now wrap around the rear edges and have running lamps that continue straight across the rear—showing off the advantages of LED arrays. In general, the exterior focuses around adding to the existing design. But don’t take that to mean that the Edge hasn’t seen a full rethink. Every inch of its sheetmetal has been reshaped, and every detail redone. Much of the work focused around cues that designer Kevin George calls “classic Edge features,” like the crossbars in the grille, the beltline crease, and the upkick of the thick rear pillar; yet new side-body sculpting helps make the design a little bit lighter and more agile in appearance. From the rear, especially, the wrap-around taillamps, combined with the still-prominent rear pillar (at a time when some are blacking them out) add up to a look that’s rather sport-wagon-like; and new lower-body details in the air dams and lighting add to that impression, we think. While the level of change given to the exterior only ratchets this model up with the rest of the Ford lineup, its remake somehow feels more dramatic inside. Perhaps that’s because the Edge’s previous generation predated the automaker’s focus on interiors. The 2015 Edge gets essentially a somewhat higher-set, chunkier version of the interior that’s elevated the Fusion sedans above most of their rivals in terms of design, detail, and touch. There’s soft-touch material nearly everywhere. Controls are simplified, with nice matte-black facing for the center console, and the Edge gets a version of the reconfigurable gauge cluster—navigated through steering-wheel toggles—seen elsewhere in the Ford lineup. About the only thing we’d want different are more lighter-tone choices—and perhaps to banish the piano-black material that still appears in door pulls and cupholders, just where it would collect greasy fingerprints. Like a lot of today’s Ford models, it feels quite austere and German...at a time when German automakers are brightening up their cabins. One thing that’s great from a functionality standpoint: The Edge replaces a lot of the irksome items from its last mid-cycle refresh with real buttons. There’s a big round knob that clearly and precisely affects sound-system volume; climate controls are clearly marked; and you can control the heated and cooled front seats in the Titanium with physical buttons. The 2015 Ford Edge has three different powertrains, each offered with either front-wheel drive or all-wheel drive. While that seems like overkill, each of these appeals to a relatively different kind of customer. While as much as 85 percent of previous Edge models were sold with the naturally aspirated (non-turbo) V-6, Ford has now made the EcoBoost turbochagred four-cylinder engine standard; and it’s allowing it to be paired with all-wheel drive for the first time. That’s not all; the 2.0-liter EcoBoost four-cylinder has been reworked and given twin-scroll turbocharger technology, which effectively reduces turbo lag, improved smoothness and drivability, and brings minor improvements to efficiency. It’s also now good for towing up to 3,500 pounds. Its output now stands at 245 horsepower and 275 pound-feet, respectively. This is a smooth engine, and it responds smoothly and confidently, without the need for frequent downshifts; it should be perfectly adequate for most shoppers who don’t care about high-performance driving. One odd sidenote: Premium fuel isn’t required or recommended, yet the engine-output specifications are given for that fuel. For base-grade 87-octane fuel, torque doesn’t change but power output does—to around 220 hp. In the middle, there’s the 280-horsepower, 3.5-liter V-6. Ford views this engine as a sort of assurance plan for the new lineup, in case some shoppers won’t spring for the turbocharged engines. Then the 2015 Ford Edge Sport steps up to the new 2.7-liter twin-turbocharged V-6, replacing the 3.7-liter V-6 as the more performance-oriented powertrain. It makes 315 hp and 350 lb-ft, and on hard acceleration it burbles in an off-cadence purr that reminds us of a five-cylinder. It’s remarkably smooth, but a bit muted in its throttle responses; while not nearly as strong at the lower revs as the 3.5-liter EcoBoost that’s available in the three-row Ford Flex (among many other models), it’s punchier in the middle. It’s a performance powertrain, but with the muted demeanor and lack of any momentous high-rpm power peak, it’s deceptively fast, and we tended to find we were going quite a bit faster than our sensations told us. Across the model line, the six-speed automatic performs even better than it did in the last-generation Edge; anyone who’s thinking that having two or three more gears in some of the competition is a solid advantage should take those models for a long drive and contrast the Edge’s positive upshifts and clearly defined downshifts with the hesitation and unease you often end up with in those other vehicles. If you pull the shift knob back into the ‘S’ step, you can access full control via steering-wheel paddle-shifters; use the left paddle in ‘D’ and it will allow a temporary downshift for about ten seconds. With a stiffer body structure, Ford has been able to spend more time getting the suspension tuning exactly where they’d like it to be, and with a new multi-link rear suspension geometry, the Edge has great body control and a precise feel on the road, without making ride quality overly hard or harsh. There’s much more of an impression of the road and the forces as they build compared to the previous version, and compared to most crossovers on the market, and the Edge steers precisely and tracks straight ahead without fuss, and one that you simply feel secure with. It’s quite sedan-like in that respect. The steering doesn’t have multi-mode settings; there’s just one calibration, and they got it right. Edge Sport models have a noticeably heftier on-center feel and a little more weighting off-center. And brakes felt a little touchy at first but do provide strong, reasssuring stopping power. The Ford Edge was already one of the larger crossovers to offer just two rows of seating, and the 2015 Edge keeps to that layout. Yet with about four inches of additional length, an extra inch or so of height, and nearly an inch of additional wheelbase, the Edge now nudges up the available space for both passengers and cargo. 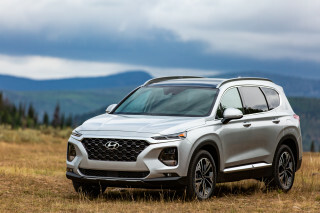 And if you steered away from the last-generation Edge for its rather barren interior feel, you should definitely return again for another look, as this model has gone from a one of the least detail-oriented to one of the most so. 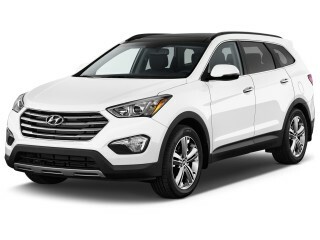 We can see this vehicle appealing especially well to empty-nester types, as its back-seat space is more than ample, and there’s a lot of cargo space on tap when you fold the rear seatbacks forward. In the absence of clever cargo-stowage tricks, the Edge feels very much like a vehicle designed more for people than gear. The seating position in front is rather high, yet it affords enough headroom above and offers a good view out over the hood. And in back, even with those front seats all the way back there’s enough legroom and kneeroom for long-legged adults. While the positioning of the seating is great, it’s the cushioning and proportioning of the seats that doesn’t quite deliver on what the upper Titanium and Sport trims promise, which is a premium ambience. The front seats have lower cushions that are just too short, as well as a little skimpy for thigh support alongside. The Edge Sport claims to have sport seats with perforated suede inserts, but we didn’t find the contouring of the significantly better. And the second-row bench is rather flat and hard. 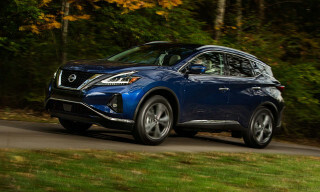 We like how the backrest is rake-adjustable, but if its outboard positions were more contoured and cushioned—like those in the Nissan Murano, for instance—it would feel like a more premium space in back. Additionally, taller passengers might find headroom tight against the frame of the otherwise-wonderful Titanium’s Vista Roof. Seat folding is very easy, though, and there’s now 73.4 cubic feet of cargo space with the rear seatbacks folded or 39.2 cubic feet with the seats up in place—seven cubes more than before, thanks to some better packaging with the wheel wells. There’ll be no complaints about a lack of places to put smaller items in the Edge. There are storage spaces seemingly everywhere. Just around the front seats, that includes a shallow but large latched bin atop the dash, a huge center console, a bin just ahead of the shifter, deeply carved-out door pockets, and a drawer ahead of the driver’s left knee. Sport models include active noise cancellation technology, and it makes these models feel quieter inside—especially on coarser surfaces—than the rest of the lineup. All models, though, get a long list of new noise-abating measures, including better sealing, more insulation, wheel well liners, acoustic underbody panels, and acoustic glass—plus additional acoustic front side glass in the Titanium. The soft-touch materials throughout the interior—not just in upper panels around the front seats, as in some vehicles, help with acoustics and general ambience, too, we suspect. Ride quality for the Edge lineup, in general, is rather firm but quiet and well-isolated. Sport models verge on stiff, with their monotube dampers and firmer tune, so we’d recommend that if you’re considering the Sport and live near potholes and choppy surfaces that you take a long test drive and decide for yourself. The 2015 Ford Edge offers a lot of safety technology, as well as some handling and stability technologies that should help keep you away from trouble. But in addition to that, we have high expectations for its occupant protection. Since the 2015 Edge is built on a structure that’s all-new (it’s based on the Fusion, but shares very little with it), it can't even be compared to previous versions. And thankfully it's much-improved, now with top 'good' results in (moderate overlap) frontal and side impact tests from the Insurance Institute for Highway Safety (IIHS) and five-star overall results from the federal government. The only weak point thus far is an 'acceptable' rating from the IIHS in the tougher small overlap frontal test. 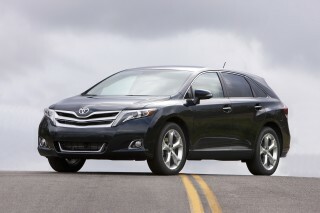 And the Edge lacks full autonomous emergency braking, which disqualifies it for the IIHS Top Safety Pick+ tier. Ford notes that shoppers for this class of vehicle tend to prioritize safety technology over infotainment, and that more than half would be willing to switch brands for tech features; so the automaker stepped up its already solid strategy for packing in safety features. All Edge models, even the base SE, include a rearview camera system; but even on the high-level Sport and Titanium, the desirable active-safety features are optional. On top trims, that includes a 180-degree front camera system with washer, a rearview camera system, adaptive cruise control, a BLIS blind-spot system with cross-traffic alert, collision warning with brake support, and the lane-keeping system. There’s also an available Lane Keep Assist feature that will pitch in and apply steering force to help keep you in your lane. It works quite well, thanks to a multi-mode intervention setting; and it can easily be shut off, allowing you so stick with warnings only, which are communicated via a steering-wheel vibration. You do have to keep your hands on the wheel. In addition to the usual full suite of airbags, the 2015 Edge includes an active glove box knee airbag, which cushions the front passenger’s knees in an impact, as well as inflatable rear safety belts, which help reduce crash forces and reduce head, neck, and chest injuries. Our only beef with it is that those inflatable belts are optional. The Edge’s electronic stability control system also has something called Curve Control, which works to slow the vehicle gently while providing corrective action just before—rather than after—you reach the grip limits of the tires. Roll Stability Control also helps keep those interventions safe, given the taller center of mass of crossover vehicles like the Edge. The 2015 Ford Edge comes in SE, SEL, Titanium, and Sport models. The Titanium effectively replaces the Limited as the top trim in the lineup, as Ford has done for most of its other models; it’s Ford’s attempt to recast its top model in more of a tech-centric (rather than traditional-luxury) light. Meanwhile the Sport is the only model in the lineup to include the 2.7-liter twin-turbo V-6, as well as a host of other performance-oriented upgrades—as well as the blacked-out look. Base Edge SE models include all the features that are expected today in a mid-size, mainstream vehicle, like full power accessories, air conditioning, cruise control, painted alloy wheels, and the Sync connectivity system. They also include an overhead console, tilt/telescopic steering adjustment, and all the storage cubbies and bins of the other models. SEL models step up to dual-zone climate control, upgraded cloth seats, reverse sensors, heated mirrors with LED turn-signal indicators, bright exhaust tips, a leather-wrapped steering wheel with additional toggles, and exterior body-color details. You can add heated leather seats and MyFord Touch for $2,700. Titanium models add a 12-speaker Sony audio system with HD Radio, as well as MyFord Touch, and a hands-free tailgate system, while you can opt for a heated steering wheel, panoramic Vista Roof, 180-degree front camera with washer, remote start, rain-sensing wipers, second-row inflatable seatbelts, heated rear seats, HID headlamps, and a clever Active Park Assist feature that will essentially let the car steer itself into the space (even perpendicular spots) when you manage the accelerator and brake. And adaptive cruise control with collision warning is a separate standalone option, for $1,300. All said, you can end up with an Edge Titanium pricing past $46k, or an Edge Sport reaching even higher. That’s entering the range of carefully equipped versions of the BMW X3, Audi Q5, and Lexus RX. 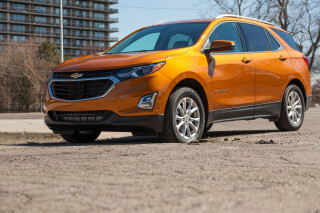 And while we haven’t yet seen the base SE or the SEL, we tend to think that with their price point, they offer the best value in the market—against models like the Honda CR-V or Chevrolet Equinox. For 2015, the Edge takes another step forward to embrace Ford’s EcoBoost engine technology. And while the gains might not be as significant as some might expect, they edge this model up against rival models—and bring the sort of EPA numbers that were typical for a mid-size sedan just a few model years ago. With the 2.0-liter EcoBoost four-cylinder engine getting a list of improvements for 2015, including new twin-scroll turbocharger technology and a redesigned cylinder head, the potential is there for slightly better efficiency to go with those noticeable drivability gains. Yet actually, the Edge’s official EPA highway number, in front-wheel-drive form, is down 1 mpg versus last year—to 20 mpg city, 30 highway, or 20/28 mpg with all-wheel drive. One the bright side, you can now get that 2.0T engine with all-wheel drive; and for 2015 it’s the standard/base engine in the Edge, whereas you pay $425 extra to get the previous base engine, the 3.5-liter V-6. The V-6 rings in with city numbers of 17 or 18 mpg and highway ratings of 25 or 26 mpg. 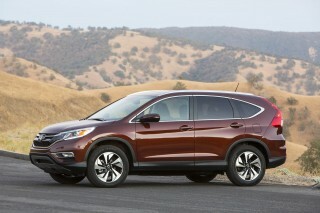 Stepping up to the top Edge Sport now gets you a 2.7-liter twin-turbo V-6 instead of last year’s larger 3.7-liter V-6. The new EcoBoost 2.7 produces much more torque (and stronger acceleration) than that previous engine, but it isn’t all that much more fuel-efficient; it brings EPA numbers of 17 mpg city, 24 highway with AWD (the way you’ll probably want this performance model), or 18/27 with FWD. Because of the way the Edge’s all-wheel-drive system is configured (its driveshaft to the rear is spinning all the time, and the system adds some significant weight), models with AWD see their mpg numbers drop by up to 2 mpg combined versus front-wheel drive. 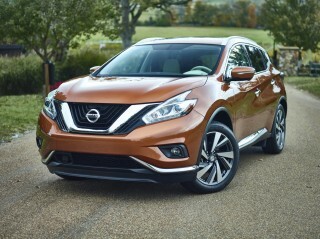 What we’d consider the Edge’s leading rival, the Nissan Murano, achieves an EPA-rated 21 mpg city, 28 highway with a V-6 engine. Engine stop/start will be available on the 2.0T, but Ford hasn’t yet released estimates with that option (since it’s sometimes down to rounding in EPA calculations, the numbers might actually stay the same). Real-world observed fuel economy with Ford’s EcoBoost turbocharged engines has been disappointing in general, against EPA ratings. Although a combination of revised ratings and technology updates such as what was just given to the 2.0T may help close the gap. We’ll update you with our own mileage observations as soon as we can get an extended drive of the Edge, on familiar roads and at a more leisurely pace. Comfortable, powerful, responsive, quiet, attractive and fun to drive. More than I wanted to spend, but it's a hoot to drive! 2015 Edge Sport Fwd, awesome!